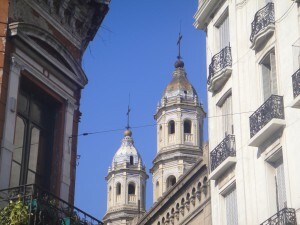 Buenos Aires, meaning good air, is the largest city in Argentina and also serves as the capital of the country. Buenos Aires a high energy city with strong European ties is a port city located on the southern shore of the Rio de la Plata bordering Uruguay. Situated on the southeastern coast of South America, Buenos Aires is the continents third largest metropolitan area. 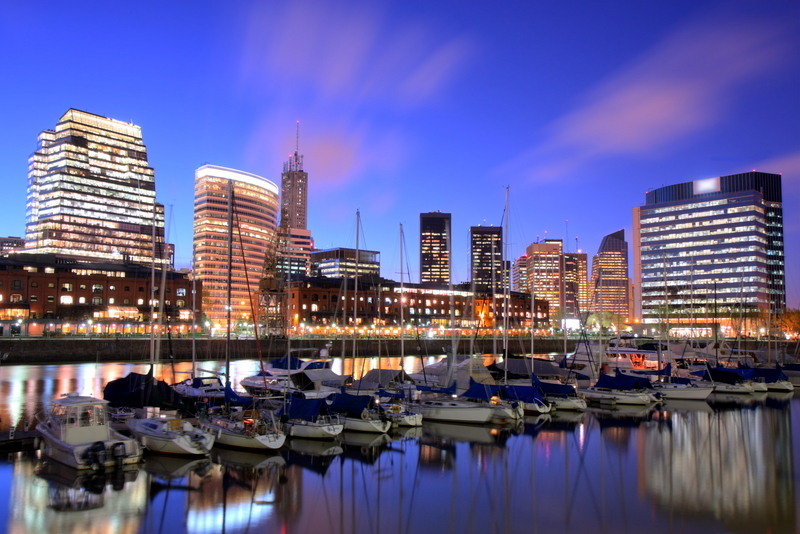 Located in the Pampas Region of Argentina, Buenos Aires is geographically bordered by the Rio de la Plata to the east northeast, by the river Riachuelo to the southeast and Avenida General Paz separating the city from the Province of Buenos Aires to the west. I am in Buenos Aires once again on a Sunday, not that being here on a Sunday is bad, it’s just the city is very quiet, For a major city Buenos Aires will not start coming alive until mid afternoon and then most shops will still be closed with only a handful of restaurants opening up. So waking up early and not wanting to eat in the hotel, I try to get away from eating in hotel restaurants as much as possible, I feel it’s too Americanized and you are not getting the taste of the local culture. Today my friend, an American who is living here in Buenos Aires called me up early knowing I would already be up since I am a early riser, asked if I wanted to meet at Cafe Tortoni for coffee, I looked at the time and said let’s do it. Not that the time really matters for coffee it just a matter what time you are going to Cafe Tortoni. For those unfamiliar with Cafe Tortoni, this is the oldest cafe in Buenos Aires, Located on Ave De Mayo, just a couple blocks down from the Pink House, Buenos Aires answer to the States White House. Opened in 1858 by a French Immigrant, Cafe Tortoni has become a very popular stop on the tourist tours of Buenos Aires. 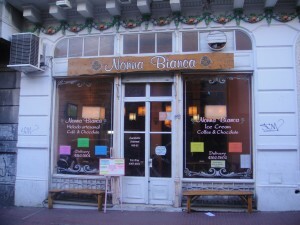 The cafe is decorated with antiques and the walls are covered with old photo’s on the history of Buenos Aires giving the cafe a air of yesterday and years gone by. So our decision to meet for coffee on a Sunday morning was more on timing, Sundays few cafes are opened early yet Cafe Tortonis can be found opened. If you are interested in seeing Cafe Tortoni it it advisable to go early. We arrived just before 9am to find only a few table occupied. This early it is very pleasant to sit, talk, drink coffee and enjoy the history of the building. By the time we left almost a hour later the place was almost 3/4 full the noise level starting to rise. Later in the afternoon when I walked by the line to get in was at least 50 deep with more tour buses pulling up. 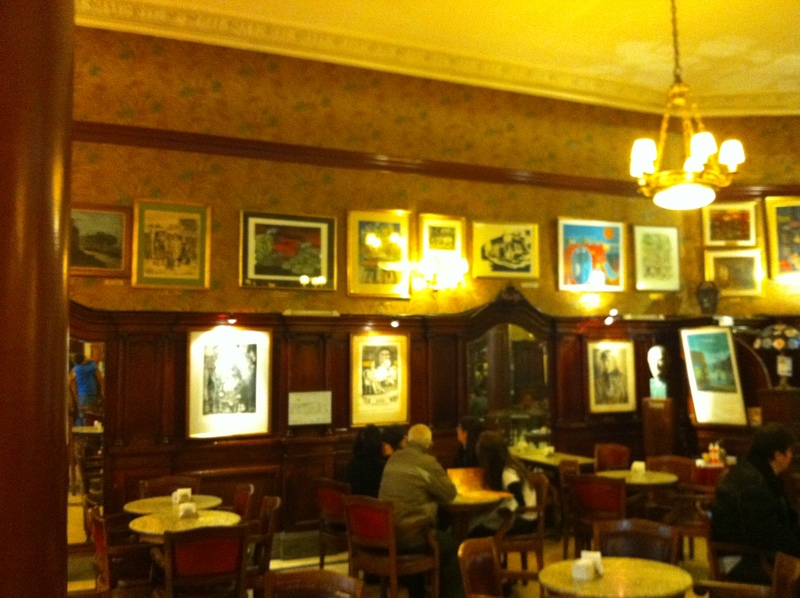 Looking for good coffee, a little bit of history and you are in Buenos Aires on a Sunday, try Cafe Tortoni. 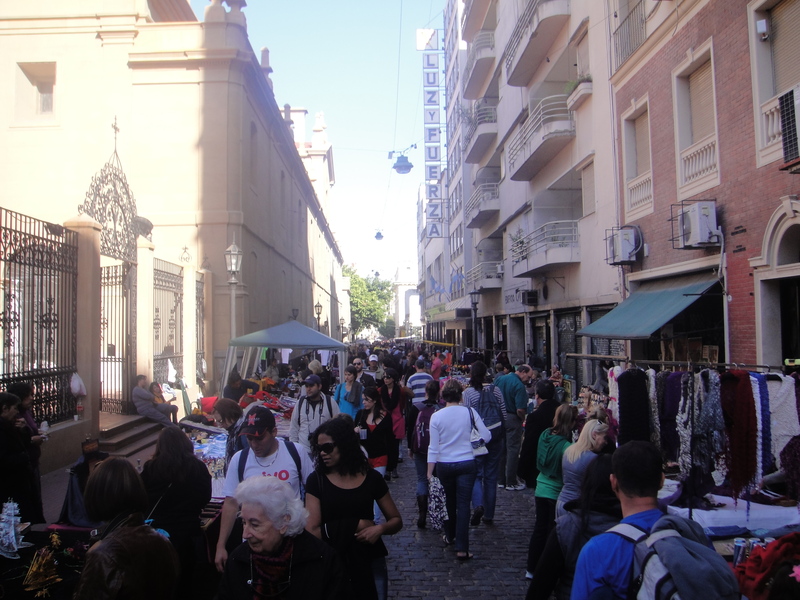 Then stroll down to Plazo de Mayo to view the Pink House and make your way to Defensa Street for the street fair that stretches from Plaza De Mayo all the way to Plaza Dorrego in San Telma, another Sunday favorite in Buenos Aires. Buenos Aires on a Sunday is almost completely shut down, the normal shops, restaurants and even the little markets seem to be closed for Sunday. Like any major city around the world, Sunday is usually a quite day in the city. Arriving late from New York to Buenos Aires due to the high winds and runway closure in New York’s JFK Airport we did not arrive to the hotel in Buenos Aires until around 1:30pm, a very long night. For me arriving so late in the afternoon it would not be a good choice to go to sleep, the consequence for me sleeping this late would be that I would be wide awake all night. An early get up the next day for a day trip to Montevideo and back to Buenos Aires meant that it would be better to stay up and sleep tonight at a regular time. 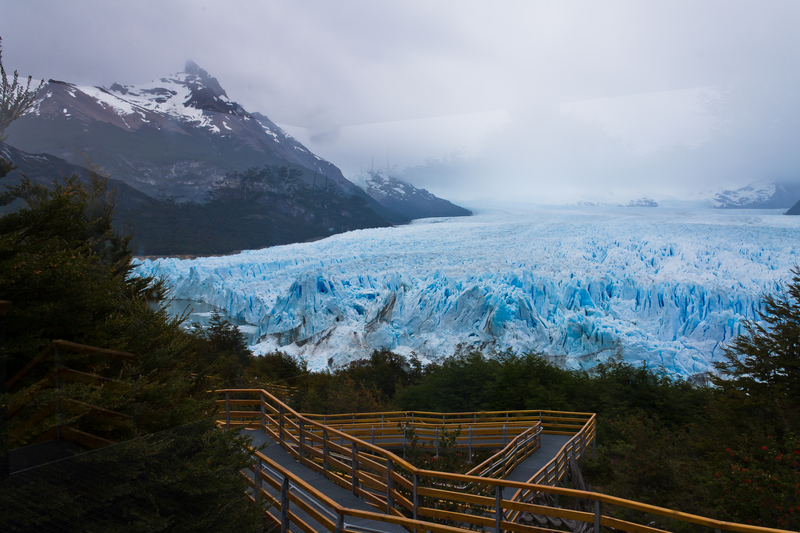 In my mind I had spending the afternoon sitting at a small café on the water in Puerto Madera or at one of the cafes lining the park center in San Telma. Talking with my first officer on what his plans were, he told me he was interested in finding an Ice Cream shop that he had read about and a leather store. I was tired, but I could always go for a good ice cream, not so interested this day in a leather shop. So off we headed in search of his desirable ice cream store. Heading towards Plaza de Mayo we turned on Defensa Street, as we made the corner I noticed the normal tables set up along the street selling trinkets, watches, video’s and you name it. I thought to myself that the rest of the Buenos Aires was closed yet the normal street vendors were out on a Sunday. As we walked down Defensa, the vendors became more frequent and the crowds started to grow. I also noticed that the vendors were not selling the familiar trinkets; the goods were taking on a more antique look. It was not long that we came to a little rise in Defensa and I could look about a ½ mile down the street, it was then that I realized this was not just a few venders put hundreds of them lining the street with thousands of people walking and shopping. I was soon to learn that this was a normal ritual that dates back to the 70’s and am told it just gets bigger and bigger. I for one am not that interested in antiques, but this walk down narrow cobble stone streets and old architecture buildings became interesting. I cannot tell you how many different Victrola record players we saw, you know the tulip shape ones; it had to be over a hundred in different sizes. Antique knifes from World War 2, old world chandeliers. This was becoming enjoyable. 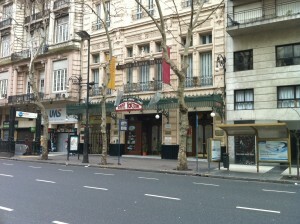 To my amazement, we ended up at Plaza Dorrego , the central park in San Telmo, just where I had originally wanted to go. 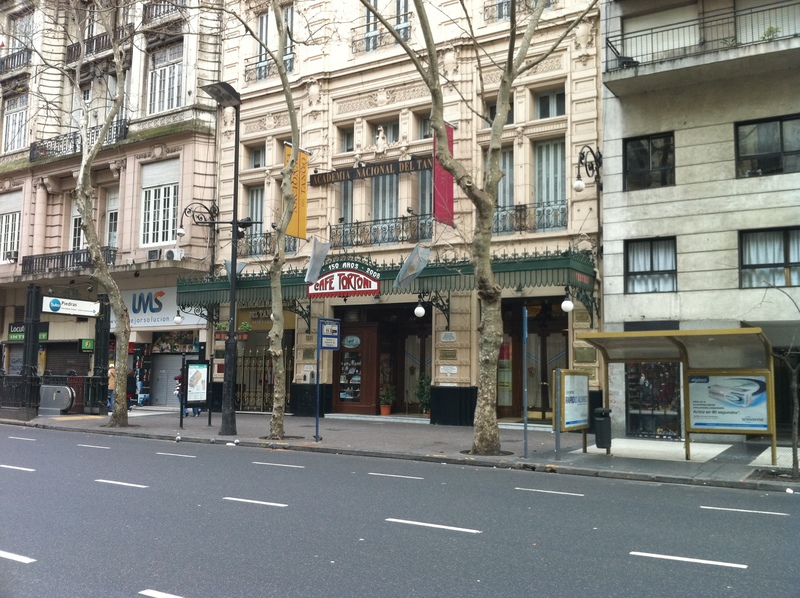 I have been to Plaza Dorrego and San Telmo several times but via a different route. Today the Plaza was filled with all kinds of vendors selling everything from antiques to a variety of food; there were Tango demonstrations as well as singers on the streets bordering the Plaza. You are probably wondering what happen to the Ice Cream store, well our initial walk down Defensa we did not find it, at Plaza Dorrego I took out my iPhone, punched in the name “Nonna Bianca” and found we had passed it 3 blocks back from where we came. Headed back 3 blocks we found it on the corner of Estados Unidos and Defensa. Soft Ice cream awaited us inside with over 50 flavors to choose from. I will admit that I went for the ¼ liter which was 3 scoops, Dulce de Leche, bianco chocolate and get this cervesa ice cream(beer). Well worth the walk, all in all we spent about 4 hours walking and enjoying the sites of Defensa and San Telmo, what a great way to spend a Sunday afternoon in Buenos Aires and to work up an appetite for some great Argentinean Steak and Mendoza Wine that evening, but hey that’s another story.